A tour in the sun. This website is the dream of two tour guides who want to promote Apulia and Basilicata, regions chosen for the wealth of interesting sites, and because both are locations these guides love working in! All tours are designed with a respectful mind to the environment and the rhythm of the land. Enter to get to know the guides and find advice in Italian, English and Japanese -cooming soon-. Licensed tour guide speaking Italian English and Japanese. 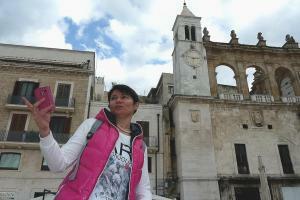 Silvia loves showing the beautiful and various towns of Puglia and tailoring itineraries to experience on foot either on the two wheels. 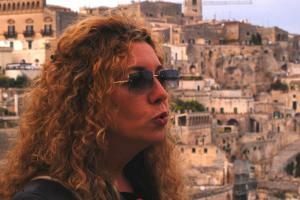 Licensed tour guide (Italian, Japanese, English) offers tailor made tours in Basilicata. Matera and a lot more: organized tours and guided visits to discover the fascinating sites of hidden Basilicata, witnessing ancient civilizations framed by suggestive landscape. Our itineraries include regional corners yet unexplored by the most, besides world-famous landmarks. Framed by the Regional Park of Rupestral Churches, the Unesco site of Matera is the highest expression of rupestral architecture, achieved by man’s enginiousness in a suggestive yet challenging territory. We’ll guide you in the discovery of churches and cave houses finely restored to preserve their origins. The Vulture Melfese itinerary spreads across the little towns of Melfi, Acerenza and Venosa, visiting medieval castles only surrounded by nature. Basilicata also boosts many parks to enjoy nature as well as to learn about its folkloristic traditions. Least, but not last, a guided tour between Ionian and Tyrrhenian Seas is ideal to explore the ruins of ancient Magna Grecia, with the archaeological sites of Metaponto and Policoro as well as the wonderful seaviews of Maratea. Stretched as a natural bridge towards the Eastern Mediterranean, the heal of Italy still holds the footprints of the many civilizations that crossed its history, enchanting today’s travellers with the sceneries and intense flavours of its land. The two seas embracing Puglia have seen people travelling from all over Europe and the Mediterranean Basin, to harvest the fruits of its land, all contributing to build a heritage of rare variety and inestimable value. The ancient history of Puglia still shows in many significant archaeological sites and findings, such as those displayed in the Museum of Taranto, in the tombs of Canosa and the ancient settlements of Egnatia. Just as charming, Castel del Monte and the capillary network of castles developed over the centuries to defend the Apulian territory also deserve a visit, as much as Itria Valley and the timeless magic of its trulli, one of the most peculiar features of the region, the grand Romanesque Cathedrals and the multitude declinations of Baroque architecture in Salento. 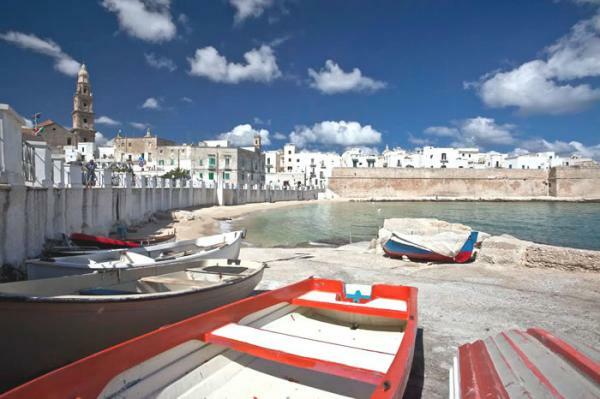 Tourists love the locals’ welcoming, the authenticity of Apulian cuisine and the lively atmosphere of old towns where past and present blend in harmoniously. Through their religious devotion, Apulian people have preserved many atavistic traditions alive with ancient choreographic festivals and celebrations, while also showing outbursts of innovation in the proliferation of significant cultural events, involving little towns as much as large cities within the region. CYCLING&TREKKING: Are you a bicycle fan? The best way to visit the heel of Italy is pedalling along its gently rolling plains. Contact us for further info about guided cycling itineraries in Puglia.